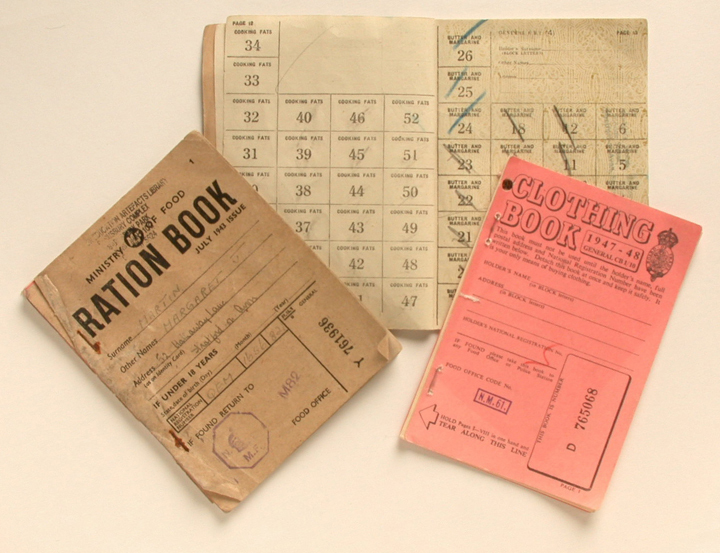 These food ration books from 1941 and 1943 belonged to Alan and Margaret Martin who lived in Stratford-on-Avon. Their names are on the front cover, along with their National Registration Numbers. The books have been well used - several pages are missing from each book, coupons have been cut from the remaining pages and some coupons are scored through. During World War II in Britain, everyone had food coupons issued for a year at a time. When people wanted to buy something, they handed their ration book to the shopkeeper at the same time as they handed over their money. And the shopkeeper would either cut out the coupons or cancel them out with a pencil. Families had to register with local retailers where they could exchange their coupons for food. There is a page inside the food ration books for the names and addresses of shops. The Martins got their meat at Henson the butchers and their eggs, cheese, bacon, sugar and butter at Burton's Stores in Stratford-on-Avon. These shops' stamps are in the ration books. This clothing book is for the period 1947-8. Although the war ended in 1945 there were shortages for a while after. Clothes rationing continued until 1949 and food rationing until in 1952. 'This book is your only means of buying clothing' declares the front of this book. But the owners must have found some other means of getting clothes since it is unused. There is no name on the front and the yellow, magenta, olive and crimson coupons on each page are intact. There were food and clothes shortages in Britain during World War II. Food rationing was introduced in 1940 and clothes rationing the following year. People were issued with separate ration books of food and clothing coupons. They still had to pay but the coupons meant that no one bought more than their fair share. There were no exceptions to rationing - even the Royal Family had to follow the rules, and cut down on rich foods and fine clothes. The 1941 food ration book contained coupons that could be exchanged for butter and margarine, cooking fats, sugar, ham and bacon. The coupons were numbered on each page. Over the course of the war more foods were rationed. The 1943 book lists a wider range of rationed foods, covering cheese, fresh eggs, jam, tea, breakfast cereals and milk. But some foods were not available at all - there were no bananas, oranges or lemons or chocolate. Families were limited in the amount they could eat, and the nation went on an unofficial wartime diet of vegetables, dried eggs and grains and tinned foods. There was less fat and sugar in meals and so people tended to be healthier and have trimmer waists. But people found it difficult to do without food they enjoyed, and found many meals quite boring. The government encouraged people to grow vegetables to add variety, in a campaign called 'Dig for Victory.' And they devised ingenious recipes, like Mock Sausages, Pea Puree Pancakes and Cheese Pudding, which made the most of potatoes, dried eggs and tinned ingredients. Clothes rationing was similar to food rationing in that people were given a limited amount of coupons each year to buy wool, material, clothes and shoes. But it was not necessary to register with shops and the coupons could be exchanged at any clothing store. Coupons were not itemised and numbered and could be used to get any garment of choice. Each piece of clothing was worth a certain number of coupons. For example, coats were worth 11 or 14, blouses or shirts were worth 5 while ankle socks could be had for 1 coupon. In 1941 each person was allocated 66 coupons a year but this dropped throughout the war; the 1945 book had 36. After the war the number rose again and the post-war book has 68 coupons. Coupons became valid at different times so that people would not use up all their coupons immediately, leading to runs on goods and shortages. Since new clothes were limited, people wore their clothes time and again, mending rips and darning holes. They made old fabrics into new clothes, changing pillowcases into white shorts, blankets into coats, wool socks into tank tops. Clothes were recycled, with children wearing outfits made from their family's cast-offs. Wartime fashions were austere. Short narrow jackets and slim skirts were popular, as they did not use much fabric. People had to take their ration books with them wherever they went. It was the only way of getting rationed food, and if books were lost or misplaced it was awkward to get replacements. People even had to take the books into the air raid shelters. A notice on the back of one of the books instructed, 'Air raids - Always have ready: outdoor clothing, gas mask, identity card and ration book.' Families had to take their food ration books on holiday too - they had to present the books at the Food Office and get emergency cards to use while they were away. A baked dish made from milk, dried eggs, breadcrumbs and a little cheese. A mask fitted with a chemical filter to protect the wearer from breathing in harmful gases. A card that gives information on the owner's identity - name, address, date of birth etc. Sausages made from white cabbage, potatoes and breadcrumbs. Pancakes with a spreading of mashed peas, served with grated cheese. A book containing coupons that people exchanged for food or clothes during the war.